Lisa Macari is a local Doctor of Audiology and in 2006 she opened The Hearing Wellness Centre. Now located in the Tecumseh Medical Centre, Lisa and her staff have been humbled and a little overwhelmed by the success of The Hearing Wellness Centre. 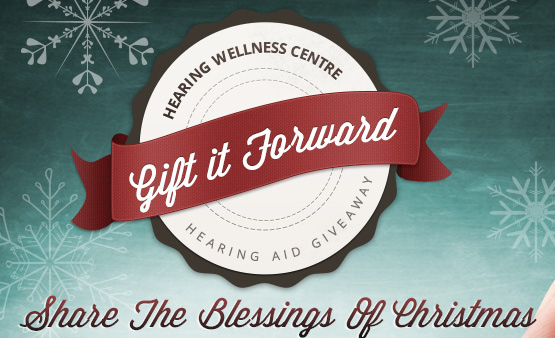 For all of these reasons – but especially motivated by a desire to give back – the team at The Hearing Wellness Centre decided to “Gift it Forward.” Inspired by a homily at her church, Lisa and her staff decided to sponsor a contest that would share the gift of hearing with a deserving person within the community. The Grand Prize is a hearing aid package valued at $5,000.00, including assessment, fitting, hearing aids and three years of post-fitting service. Two options are available to nominate someone for this Grand Prize: Go online to https://www.facebook.com/HearingWellnessCentre/app_208195102528120 to complete and submit the entry form and a 100 word essay; or to enter by mail, send a 100 word essay by mail to The Hearing Wellness Centre, 13278 Tecumseh Rd. E., Suite #104, Tecumseh, Ontario N8N 3T6. The contest closes Saturday, November 30th.